Chicken cordon bleu meatballs, a.k.a. bleu balls, are a delicious food item that I first tried at NYC’s own Meatball Shop. If you don’t know, the Meatball Shop is a beloved NYC institution that serves up creative variations of meatballs. 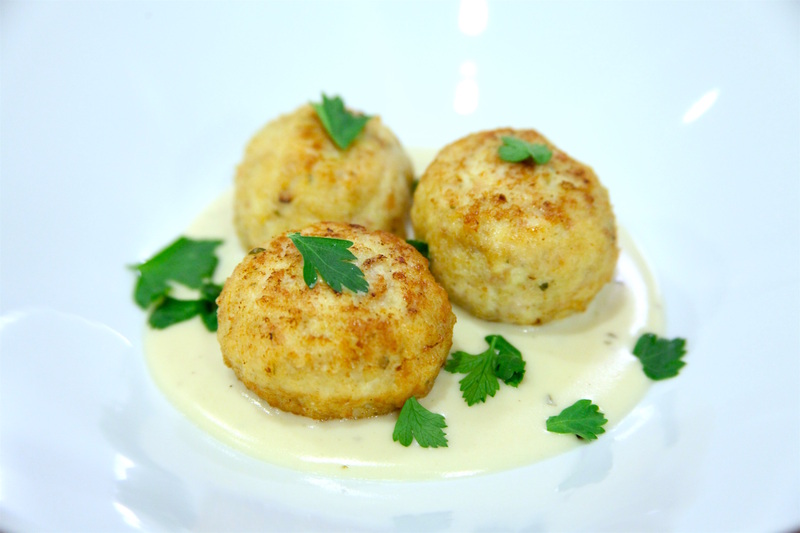 We love cordon bleu balls so much that we decided to recreate the whole thing at home alongside with a creamy classic Suprême sauce. Look at those dancing, animated meatballs (yay we can animate now!). “But Pâté–how many kinds of meatballs are there really?” So much so many you have no idea. For starters, meatballs aren’t limited to your standard 70/30 ground beef and red sauce. You can really try any ground protein with any savory sauce under the sun–and you’re encouraged to try funky combos at the Meatball Shop. Don’t project your conceptual framework of Italian foodstuffs on these balls you bully. Here at Pâté, we grind our own meat. It’s really not as scary as it looks and the meat grinding Kitchenaid attachment is one of the cheapest you can buy. But if you’re scared, you can just buy your ground meat from the store. We served these cordon bleu meatballs with a creamy Suprême sauce, a classic French velouté sauce that is so good I’ve been tempted to just eat it like soup. And have. That was too much information. 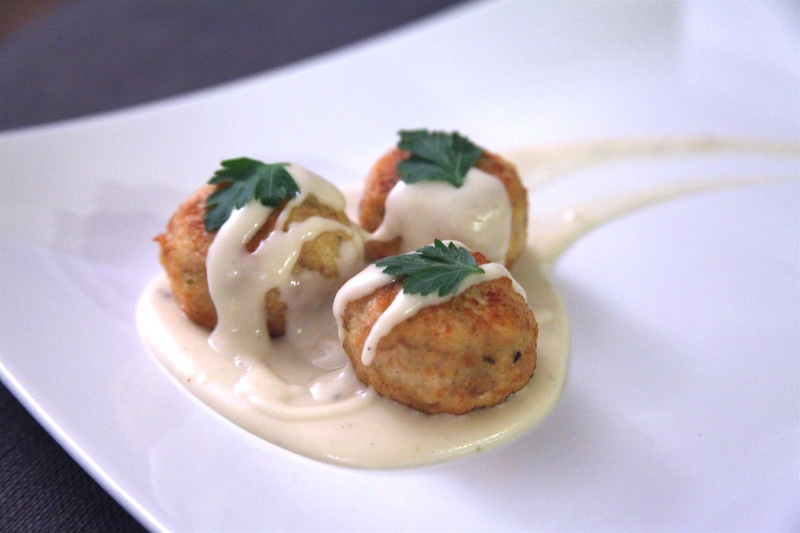 Make delicious, cheesy chicken cordon bleu meatballs using this quick chicken meatball recipe. Grind meat (optional). If choosing to grind your own meat, cube chicken breast and thigh and pass through grinder on largest setting. Pass through the grinder a second time and place in a large bowl. Assemble meatballs. In large bowl with ground chicken, add ham, breadcrumbs, eggs, salt, pepper and mustard and mix. Fill a small cup with water and set to the side. Lightly wet hands and press a golf ball size amount of meat flat on palm. Place swiss cheese cube in the middle of meat and fold up meat around it. Roll ball between hands until smooth and cheese is covered. Set aside and repeat for remainder of meat. Pre-heat oven to 350 degrees F and heat oil in a skillet to 350 degrees F.
Working clockwise, add meatballs to the skillet flipping once until browned. Remove meatballs from skillet and set aside. Place browned meatballs on baking sheet and bake 10-15 minutes until cheese begins to ooze out. Make sauce. In a medium sized saucepan over medium heat, melt butter and then slowly mix in flour. Let roux cook for 5-7 minutes until light brown. Add chicken stock, salt, and pepper. Once boiling, reduce to a summer for 15 minutes. Stick in cream and herbs and continue to cook until sauce has thickened. Serve meatballs. To serve, spoon a well of sauce onto a plate and place meatballs on top. Top with extra sauce or parsley. Made chicken cordon bleu meatballs at home? Tag your cordon blue meatballs photos with #PateSmith or share them in the comments for the chance to be featured onsite!